Review: This low-key crime drama, set in the frozen wastelands of northern Sweden, sees veteran cop Erik Backstrom (Rolf Lassgard – the original incarnation of TV’s Wallander) returning to his home town after 15 years to investigate the brutal killing of a young woman. As the case becomes more complex and the list of suspects grows, Erik has to confront his past in the shape of a nephew he barely knows and the young boy’s new stepfather (Peter Stormare), who’s also the obstructive chief of the local police force. Director Kjell Sundvall has made a loose sequel to his 1996 film The Hunters, but it can be enjoyed as a stand-alone piece and an atmospheric addition to the Nordic noir subgenre. Lassgard and Stormare make great adversaries, the former mellow and taciturn while the latter is sinister and volatile, although more restless viewers may find the pace of the story just too glacial. A detective is sent back to the hometown he was forced to leave 15 years ago to investigate a murder. The assignment digs up painful memories of the events that drove him away in the first place, while he also discovers the killing is part of a more complicated conspiracy. Mystery, starring Rolf Lassgard and Peter Stormare. In Swedish. Ninety-ninety-six’s Jägarna (The Hunters) was a medium-sized hit in its native Sweden. It told the story of a policeman from Stockholm who goes to Norrland to join his brother after their parents died. While there he started to work on a long-running case where deer have been poached and soon discovers that his brother is involved. Now it’s back, this time as a TV series. 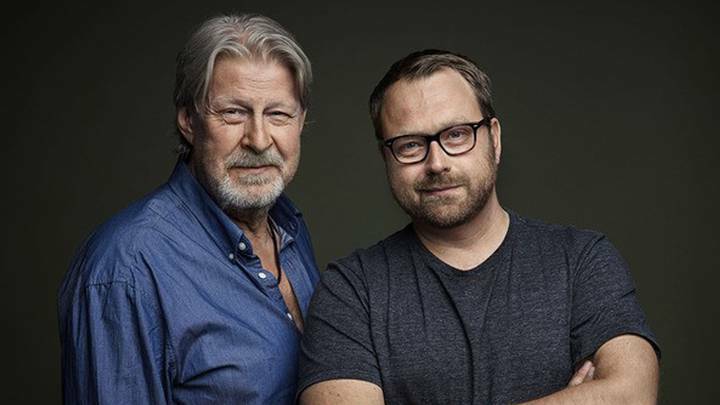 Rolf Lassgård, a familiar face in Swedish dramas, is back as the star.